What are the advantages of metal powder coatings? Metal powder is a new type of coating, which is quite different from traditional liquid coating. It contains many metal particles, such as copper, gold, silver and aluminum powder. The application of metals in modern families is still relatively rare, and the painting method is also different from traditional coatings. 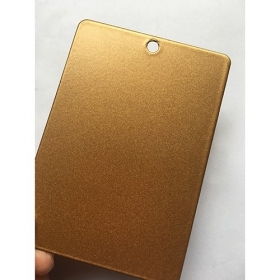 The coatings are metallic luster, with brilliant multicolor effect and outstanding maintenance function, which provide colorful decoration for industrial products such as automobiles, household appliances, instruments and meters. Powder coatings can be directly sprayed on iron or aluminium materials which are suitable for pre-treatment. After baking, excellent coatings can be obtained, such as durability of coatings, which includes wear resistance, impact resistance, tightness, toughness, corrosion resistance and chemical resistance. In addition to the advantages mentioned above, powder coatings for outdoor use include high weather resistance and pollution resistance. No volatile solvents such as organic solvents and water are used, so powder coatings are inorganic solvent coatings, which greatly reduces the potential safety hazards caused by solvents. Powder coatings are 100% solid powder coatings, fully automatic spraying can be used. Metal powder coatings can almost reach 100% utilization rate, making the coating industry to reduce waste disposal, together with the degree of environmental pollution.